If you plan on trying out for your varsity team these are the six basic volleyball skills you need to learn as soon as possible. Essential volleyball basics, essential skills you need to know to make your varsity team. Let's review these six essential skills you need to know if you intend to try out for the varsity team. First, you'll have to learn volleyball basics like serving skills before learning how to serve a ball aggressively to score points. In order to make your varsity team you need to be able to serve consistently over the net and then to earn the right to stay on the court you need to learn how to score points with your serve. That takes practice and lots of reps.
Let's learn more about serving basics. 1. The ball is sent over the net to start the rally by the player in Zone 1, the right back area of the court. 2. The serve can be made underhand but for high school, club, collegiate and International competition you need to know how to overhand serve the ball. Once the referee blows the whistle to start the rally you have 8 seconds to complete your serve routine and get the ball over the net. Once you toss the ball in the air you must contact the ball to send it over the net or let the ball drop without touching it again until it hits the floor first. If you let the ball drop to the floor, the referee will blow the whistle again and this time you have five seconds to serve the ball over the net. Next you'll need to learn how to pass or bump a volleyball. Passing a volleyball or bumping a ball are two ways to explain the same underhand technique of receiving the serve. What is passing a ball? The pass or the bump is used to describe the most commonly used technique to make the first contact of the ball after its been served into your court by an opposing team. The pass is a service reception technique used to contact a ball that's entered your court area when your team is on offense. When the ball arrives at just above your hip level you clasp both hands together, one palm inside the other, pointing both thumbs to the ground. This creates a platform with both arms that you use to contact the ball deflecting it from your angled platform to the person most responsible for making the second contact on the ball, your setter. The two players in the positions who pass the majority of the balls served by an opposing team are called outside hitters and liberos. The libero is a back row specialist responsible for passing most of the balls served to the backrow and plays defense only in the backrow. 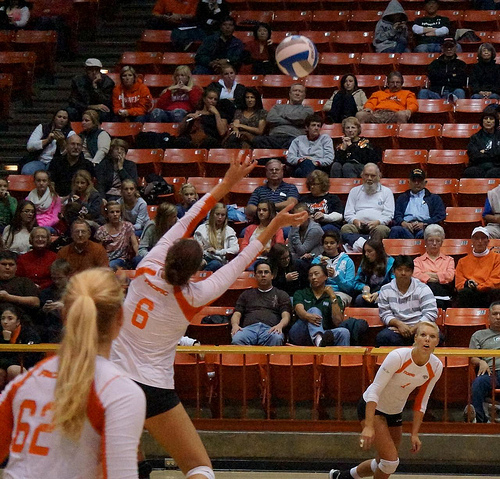 The outside hitters both left side specialist and right side specialist play in the front row when their team is on offense they move back to the middle of the court to help receive serve. Essential Volleyball Basics: What is Setting? 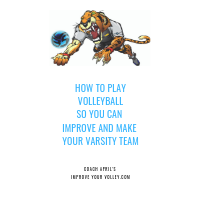 You'll have to learn the volleyball basics connected to developing good setting skills something else you'll need to know how to do before making your varsity team. You will need to learn the volleyball basics regarding your setting skills if you plan on trying out for your varsity team. A set is a way you contact the ball over your head to get the ball to travel from you to another person or over the net . Both arms are outstretched above your head with shoulders close to your ears. Once the ball contacts the fingertips of your hands you push it back up into the air towards your target, setting the ball up for the next person to contact it. 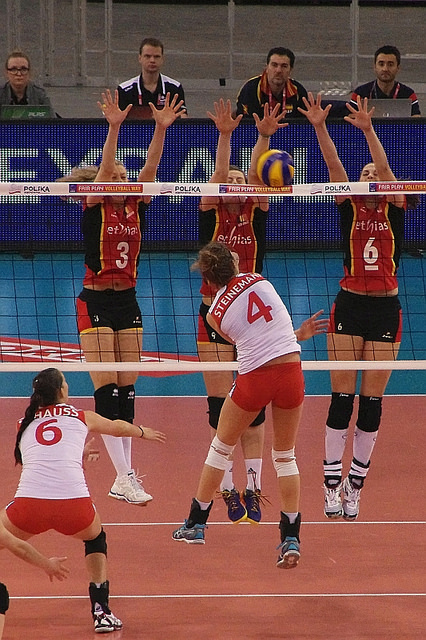 The set is usually the second contact in a rally and the person who sets the ball the most is called the setter. The setter on a volleyball team is like a point guard on a basketball team who runs the offense and calls the plays. If you are the setter on your team, you determine who gets to hit the next ball and how high and how fast the set they hit will be. Different sets have different heights and are delivered to different locations along the net. For example a four set is a very high ball that's delivered outside to Zone 4 and the five set is a high ball that's delivered backwards over the head of the setter to Zone 2. There are a number of sets to understand which you will do as you learn more about how to play volleyball. What is an Attack Hit? An attack hit or a spike describes the technique commonly used for the third contact in a rally that sends the ball over the net with power. A spike starts with an approach of three but most often four steps. The first two slow and the last two bigger and faster steps that propel you in the air gathering momentum as you go, to lift you above the top of the net so you contact the ball at its highest height to attack or hit it down into the opposing court. As you become a better spiker and your hitting technique improves, you will learn to spike faster and quicker sets that are lower to the net. You will also be able to better control the direction of your spikes, propelling the ball either down the line or cross court into the opposing team's court. A block is the first opportunity for a team on defense to keep the team on offense from hitting into their court. Once the whistle blows and your team serves the ball over the net, your team is on defense, ready to defend your court. Your team is trying to keep the opposing team, now on offense, from putting the ball on your court floor. The first opportunity to do that is at the net. The three players in your front row are blockers standing with their arms above their shoulders watching the opposing team pass the ball then set the ball, then hit the ball.. When they hit its the job of the blockers to block the ball back into their court so that it doesn't come over the net. If the block stops the ball at the net and the ball goes back to the opposing teams floor, that's a point for the block, your team, your team gets to rotate and serve. If the block does not stop the ball, then your three players in the back row have to get the ball up to keep the rally going. The primary blocker in the front row, and usually the tallest player on the team is the middle blocker. Her job is travel back and forth along the net to help the other two blockers stop the ball from coming into her team's court. On defense the middle blocker blocks all along the net, on offense she will hit and attack primarily from Zone 3, the central area of the net. A dig is what happens when the ball gets past the defensive team's front row blockers who couldn't stop the ball at the net. Now its the responsibility of the three back row players on defense to keep the ball off the floor. They do that by "digging the ball". The :dig" is an underhand technique that describes the first contact of a ball in a rally that's been sent over the net with power. To "dig a ball" you are in a defensive position, most frequently in the back row, or if you aren't blocking in the front row and you are positioned outside of your front row blockers as they jump to block a hard driven ball. You sink your hips low to the floor, below the ball before it gets to you and you use your extended arms in your platform to "dig" or deflect the ball up in the air. If you are the 'digger" or defender your job is to dig the ball up high enough in the air and ideally to the middle of the court close to the ten foot line, so that the second contact in the rally can be made. This second contact is most often made by the setter who runs to this ball where ever it has been dug up to on the court and sets it up to one of her front row hitters, so they can attack it with the third hit so that the rally continues. This was a very simple run through of the basic volleyball skills a beginner player needs to know before learning how to play volleyball or what an intermediate level player needs to do well before trying out for varsity. Now its time to dig deeper into the history of the sport and especially the skills, rules, positions, and terminology used so you can take your game and playing abilities to the varsity level. What you just read was just a warmup! Just like in volleyball practice, you do a little stretching to warm up your muscles before getting into the real meaty part of practice. Here you go through a light review of everything before you really begin to dig deep and take each rule, each position, each skill and really explore it. Learn to do tons of reps and go over each drill repeatedly until you get it right. Learn more about How to Play Volleyball by exploring the Related Links below.